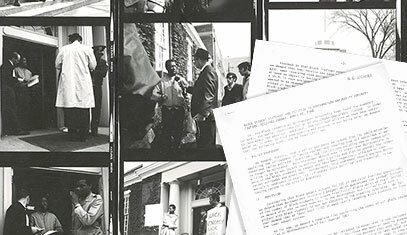 In 1968, more than 100 Northwestern students peacefully occupied the Bursar’s Office to protest the black student experience. The occupation lasted 38 hours, ending with a negotiated resolution in which the administration responded to a list of eight student demands. Charla Wilson, the Archivist of the Black Experience for Northwestern Libraries tells the story. The “May 4th Agreement,” as it is popularly known, had a lasting and major impact on the course of the University. Although work still remains to be done, the consequences of the students’ actions were striking and productive, from increasing black student enrollment and financial aid, to revised housing policies, to the expansion of “studies of black history and black culture,” among others. 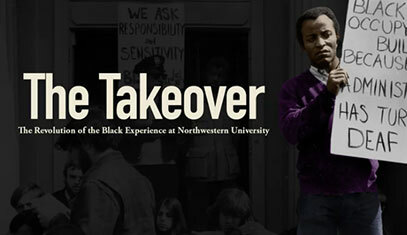 Learn more by reading about the takeover, viewing archival images and documents and watching the trailer for a documentary created by the Northwestern Black Alumni Association (NUBAA). To find out more about NUBAA 50th anniversary events, visit the NUBAA website. To honor this significant event, University faculty, staff, students and alumni are coordinating a series of commemorative events that will take place throughout the 2017-2018 academic year. 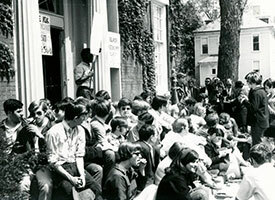 Students occupying the Bursar’s Office in May 1968. Photo from University Archives. There are no upcoming events at this time. Events will take place throughout the 2017-2018 academic year.